Martin Scorsese’s biography on eccentric millionaire Howard Hughes (Leonardo DiCaprio) will make you want to know more about the man. I think that’s a sign that The Aviator is an all-around good movie. The story (written by John Logan, Gladiator, The Last Samurai) is engaging all the way through, from Hughes’ not-so-humble beginnings to “lo, how the mighty have fallen.” In their capable hands, the story of Hughes’ life is fascinating. Biographies are hard to make. They are often episodic, with too little time fleshing out individual scenes, and with too thin a thread connecting the scenes together. But The Aviator feels like a whole, complete movie, without oversimplifying Hughes’ life. This sympathetic portrait of Hughes includes all the crazy behavior one hears about in rumors (captured neatly within an episode of The Simpsons, with Mr. Burns standing in for Hughes). We see the obsessive-compulsive germ fear. We see him locking himself away in a room, never shaving, never trimming his nails, and saving jars of his urine. But the movie also portrays him as a genuine innovator, a natural engineer with a solid grasp of aerodynamics. He thought of, for example, countersunk rivets to reduce wind resistance on the surface of a plane. Scorsese’s Hughes is also a movie producer, apparently in fulfillment of a childhood dream. His epic was an airplane movie (of course) called Hell’s Angels, and Scorsese seems to love to tell the story of its long, expensive production. It was the most expensive film ever made, up to that point. (I have since watched Hughes’ movie and though the movie itself isn’t very memorable, the aerial scenes really are amazing.) The movie required lots of money for scores of airplanes and dozens of cameras. Hughes had money to burn, so he burned it. Hughes became more interested in airplanes than movies, but kept his hands in Hollywood, particularly as a way to meet gorgeous stars and starlets. Most surprising and hardest to achieve, the filmmakers found a satisfying ending, a graceful exit for our visit with Hughes. Hughes still has his outward success, but it has broken his brain to achieve it. The Aviator is not as ambitious a project as Gangs of New York, but it still requires attention to detail in the costumes and sets. Scorsese’s longtime collaborator and production designer Dante Feretti is up to the task. Watching the movie is great fun. The settings, costumes, and design are all outstanding. Los Angeles of the late 20s through early 50s all comes to life, not in black and white, but living color. Scorsese has never looked so much like Spielberg. One could think of the two men as almost opposites, one started edgy and gritty, the other has long been synonymous with Hollywood. Maybe it’s the old East Coast / West Coast divide represented in modern filmmaking. But The Aviator has flash, glitter and glamour that looks more like a Spielbergian piece of eye candy than a warts-and-all Scorsese crime drama. There is one important way that Scorsese doesn’t measure up to Spielberg. That is in the use of computer-generated special effects. The Aviator has more CGI than Martin Scorsese knows what to do with. He doesn’t quite know how to make it really convincing. For the Hell’s Angels dogfights, Scorsese simply makes the scene fanciful and fantastic, and so the imperfect edges and the fakery are easy to swallow as an exciting, stylistic decision. But the flight of the Spruce Goose just looks kind of sloppy. DiCaprio is in that class of actors who are crushed by their own weight, like Ben Affleck and Tom Cruise. They command such a price and are such tabloid fodder that there is a backlash against them. Their performances are rarely judged on merit anymore but on their off-screen personalities. Is “Leo” any good? Is he buzz-worthy? I don’t know what the tabloids are saying, but I’d say his performance was both good and bad. He doesn’t always convince me that he has Hughes’ madness, but he’s always great at portraying Hughes youth, enthusiasm, and ambition. But DiCaprio is not as exciting to watch as Cate Blanchett as Katharine Hepburn. Hepburn had such a strong persona that any attempt at a portrayal almost feels like heresy, but Blanchett is excellent in the role. Like Anthony Hopkins as Richard Nixon (in Nixon), Blanchett interprets her character without impersonating her. She’s not exactly like the great Kate, but she understands her carriage and thought patterns, which is somehow more important. 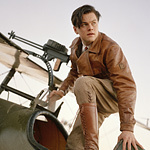 The Aviator is a very good film, both in terms of craft and entertainment. There may be the odd person for whom this era holds no interest, but most moviegoers will be both entertained and impressed by The Aviator.